This scaling mode allows you to place every stock you look at on a custom percent grid of your choosing. As you move from stock to stock, each one is viewed with your preferred percentage. Example: Set the % to 5 and each chart you look at will be forced onto a grid where the lines are exactly 5% apart. 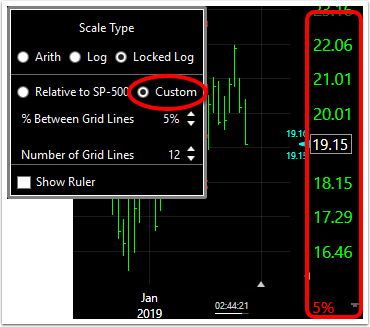 One advantage in this example is if the stock moves up 3 gridlines you know it is a 15% move. 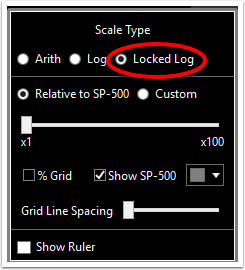 Use the radial button to select Locked Log (Logarithmic). Locking the log chart means that whatever value you choose to Lock your chart scale to, that value will be for every chart you view in this mode. Hover the mouse over the Custom Locked Log scale to tighten or loosen the chart. In either Locked Log mode, the keyboard combination shortcut Alt + Scrollwheel will tighten/loosen the chart axis.